Foot Reflexology | Become Healthy or Extinct! 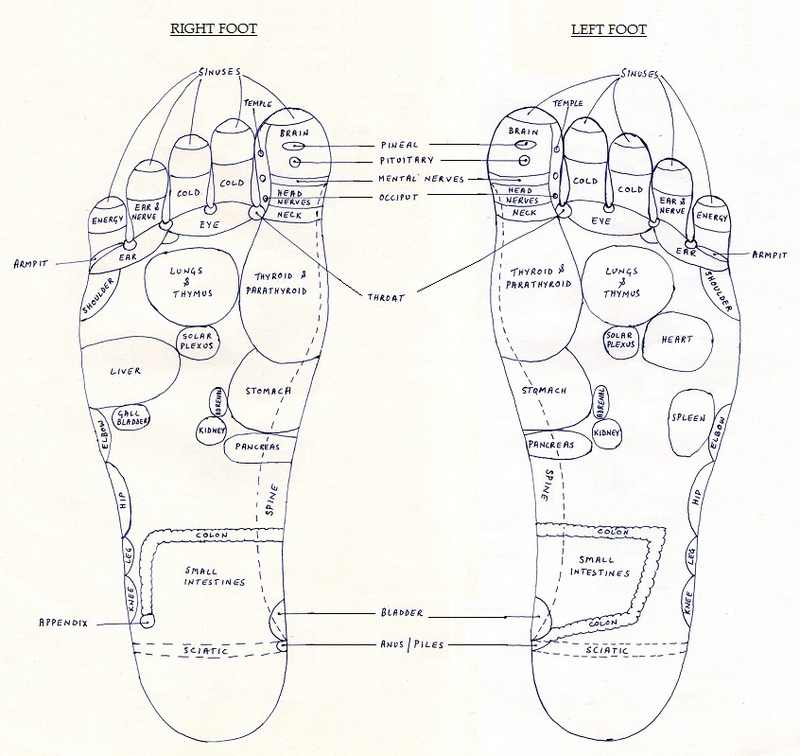 Foot Reflexology is similar to acupressure for the hands, but it is the choice of technique used when someone wants the treatment done on their feet by someone else. In this technique, relaxation and detoxification are the focus as the person is generally made to lie down on a couch or sit in an easy chair with their feet extended. It is generally not done as part of a daily routine like the hand acupressure technique explained here, which focuses more on curing organs that have been chronically ill. In foot reflexology, a therapist does not focus on the specific sequence of points to be pressed; rather a general flow of zones from the top of the foot to its bottom is followed. There are sequences of massage like the welcome massage, the main massage that focuses on the top, the middle and the bottom (of the topside as well as the under side of the feet) and the closing massage. If you want to use foot reflexology for curing chronic illness in just the same way as hand acupressure, you can, by just following all the steps given for hand acupressure. In place of rolling the acupressure ball, you will have to use the foot roller. This option may even be used when someone has an injury on the hands or a condition like paralysis. Note that if an arm is completely paralyzed, then doing acupressure on it may not benefit the body at all, because no nerve transmissions of biocurrent are happening. The corresponding foot should be treated instead. The reason why foot reflexology feels much more soothing than hand acupressure has to do with the body’s mechanism of feeling in the feet. When we use our feet, we are mostly in the upright position where the total weight of the body bears on them. This is tremendous pressure for the feet in terms of feeling sensations, so the brain de-sensitizes the feet by suppressing the nerve feedback mechanism from the feet to a great extent. This is also why you do not get a clear feedback of which points on the feet are paining when you wear acupressure slippers. But when we lie down or are sitting with our feet in the air, this safety mechanism is disabled because the body weight is not bearing on the feet and the brain freely allows all the sensations at the feet to be experienced. When the feet points are pressed in this de-stressed mode, soothing sensations are felt at the feet and people often drift into a tranquil slumber during the treatment. Feet points will be painful only when the related organs are ailing a lot. You will generally need to apply more pressure on the soles of the feet than the pressure you use in hand acupressure, since the skin of the soles are a bit thick. However, normal pressure is to be applied on the topside of the feet since the skin is not thick over there. Acupressure points on the feet may pain more than those on the hands because these points are rarely pressed deep since we wear flat footwear all the time. Choose a room where there are no disturbances and where ventilation is good. Have soothing music on standby if the patient prefers it to silence. Use Aroma oils or candles if the patient likes it or for therapeutic effect on a known ailment. You can also use the Aromas to soothe a negative mood or the lead dosha of the patient if you know it. Have an air conditioner and a room heater to maintain a comfortable temperature. Decorate the room with crystals and beach stones for a soothing effect. Have a massage table and a couple of pillows for the patient and a low chair for the therapist. If you note that the patients feet have that ‘cheesy’ odour, do a disinfectant wash on their feet and advise the patient that they have bacteria or enzymes and their feet need to be disinfected by using antiseptic washes or medicated talcum powder. Look out for ‘Athlete’s foot’ and wounds. Wash your hands and the patient’s feet with soap. If the patient’s nails are in really bad shape and an impediment to the treatment, clip them. Ways of holding the feet – Always see that you are using both your hands, one for pressing and the other for supporting the foot from the other side. The foot should not get jerked by pressing from one side only. How much pressure – Use pressure that the patient can feel is deep, but stop at the point they say the paining is uncomfortable. How long is each point to be pressed – Follow the duration given at each step with an overriding instruction to do double the stated time in two cases. First, if the patient feels very good at that point and asks for more over there. This indicates that more healing energy is required at that point. And second, at points where the patient feels pain. But do the pain point the second time with a bit of tenderness. This indicates that more toxins are present at that point and they need more time to be released. Pressing types – The thumb caterpillar walk, forward only. The finger walk, forward only. The finger walk sidewards, both sides. The double thumb walk for the middle of the foot top to down. The pressure circle for bumps and sore areas. The pinch for toes. The pointed press and release. The slide for down to top slides of the top of the foot. The 2 finger grip for soles and ankles. You can start with either foot; there is no sequence to it. Facing the soles grip the foot with both hands on the sides and gently press, fingers on the topside of the foot and both thumbs on the soles. Dividing the foot into 3 equal parts from top to bottom, give 3 presses on each section, start from the top and come down. Place one palm flat on the top section of the sole and the other hand cupping the heel of the foot. Slowly press the top section towards the body of the person, while pulling gently at the heel you have in your other hand. Stop till you feel a firm resistance or the person says it’s enough. Now do it in the opposite direction, that is, place your one palm on the top section of the topside of the foot and place the base or a closed fist of the palm of your other hand on the heel. Slowly pull with the top hand and press with the bottom hand. Stop till you feel a firm resistance or the person says it’s enough. Do this another 2 times. Hold the foot, one hand on top, fingers on the top side, thumb on the sole and one hand at the bottom, cupping the heel. Rotate the foot gently 3 times in the clockwise direction and 3 times in the anti clockwise direction keeping a lookout that the person doesn’t feel any pain. With you thumb and index finger hold the big toe and rotate it 3 times in the clockwise direction and 3 times in the anticlockwise direction. Do the same for the other toes as well. Hold the other toes that may touch the rotating toe a bit apart, so that you get a good rotation. Starting with the big toe, press the top flange of the toe, your thumb on the lower side of the toe and your index finger on the topside of the toe. Press to a medium firmness and leave 8 times. Do this for the other toes as well. Starting with the big toe, press the sides of the toe with your thumb and side of your index finger, covering the 1st 2 flanges of the toe. Press to a medium firmness and leave 8 times. Do this for the other toes as well. With your thumb at the base of the big toe and your other fingers on the topside of the toes, press to a medium firmness at the base of the toe and leave 8 times. Do this for the other toes as well. With your thumb on the sole side and index finger from the topside of the foot, do a medium pinch between the gaps of each toe 8 times. Now position yourself closer to the foot with your chin almost in line with the foot and above it. Finger walk with the 1st two fingers of both your hands starting from the base of the toes up to the ankle of the foot. Do each path you take, 3 times. Cover the whole foot side to side with this finger walk. Position yourself behind the foot again. Now hold the foot one hand on each side, your pointed thumbs placed on the sole side of the foot and your fingers on the topside of the foot. Give medium pressing with both pointed thumbs 8 times at each location of the upper band of the foot starting from the toe side and moving to the little finger side. With both thumbs, do a caterpillar walk right in the center of the foot from the sole to the base of the toes. Repeat it one more time. Do a similar caterpillar walk with the thumbs on the left edge of the foot twice and then do the same on the right side of the foot twice. Here we are treating the spinal column in one instance and the foot, knee, leg, hip, elbow, shoulder line in the other instance. With one pointed thumb, press the kidney point which is in the middle of the foot 16 times. Now sit to one side of the foot and cover the entire area between the sole and the ankle of the foot, a bit to it’s left and a bit to its right as well. This is to be pressed 8 times at each location with a gentle to medium intensity. Gentle at some areas, because some of the points here may be very sensitive. The patient may tell you so. Shift to the other side and do the same over there. This completes one foot. You can cover it with a damp towel as you work on the other foot. On the other foot, repeat the whole sequence you had done for the first foot. The closing massage can be done with oil, which has a very soothing overall effect for the feet. Using a few drops of appropriate aroma oil in base oil can also be very therapeutic. The aroma should be a soothing or relaxing fragrance. Or if the patient doesn’t like oil, or oil is not at hand, you can use water. Apply a little oil / water, just enough for a smooth massage to one entire foot, up to the ankle. Do this in slow, smooth strokes with both hands, thumbs on the sole side and fingers on the topside of the foot. With the fingers supported on the topside of the feet, slide both the thumbs side by side right in the middle of the sole, with a medium pressure from top to down 3 times. Do this for the right end and for the left end as well. Do the same for the topside of the foot as well with the thumbs angled a little towards each other moving from the base of the toes to the ankles and a bit higher. Each path 3 times, moving from the big toe side to the little toe side. When doing the sides, extend the slides right past the ankle and up to the end of the heel and behind it. Now with fingers entwined for support on the topside of the foot and the base of the palms pressing on the two sides of the foot, squeeze with a firm grip 3 times each section, top section, middle section, and lower section. Now knead the heel with firm pressure like you are kneading dough for a bit. Keep your thumb straight, against your closed fist and do a sliding action with the outer side of your thumb, the outer edge of the foot 3 times from top to bottom, with firm pressure. Do the same for the inner edge of the foot. This completes one foot. Cover it with a towel. Now do the same procedure for the other foot as well. After it is done, cover it with the towel. Keep lying down with your eyes closed and relax for at least 5-10 mins after the massage is over. Savor the calmness and deep relaxation that you feel. Drink 1-2 full glasses of water when you get up and drink a lot of water today and tomorrow for detoxification. You can wash your feet with a little bit of soap if you need to wear footwear immediately after the massage. Or instead of washing your feet, the best would be to wear socks for a few hours inside your footwear. How often is best to use this? Is there a limit to how many times a day? I do not want to over do it. Hi Ann, Foot reflexology once a day is enough – on empty stomach or 2 hours after food.